I had such a wonderful Darshan tonight with our sweetest Lord Sai. I attended bhajans at the Palm Bay Sai center. As I sat in the sublime vibrations of the center, almost immediately wonderful visions appeared in my field of consciousness. 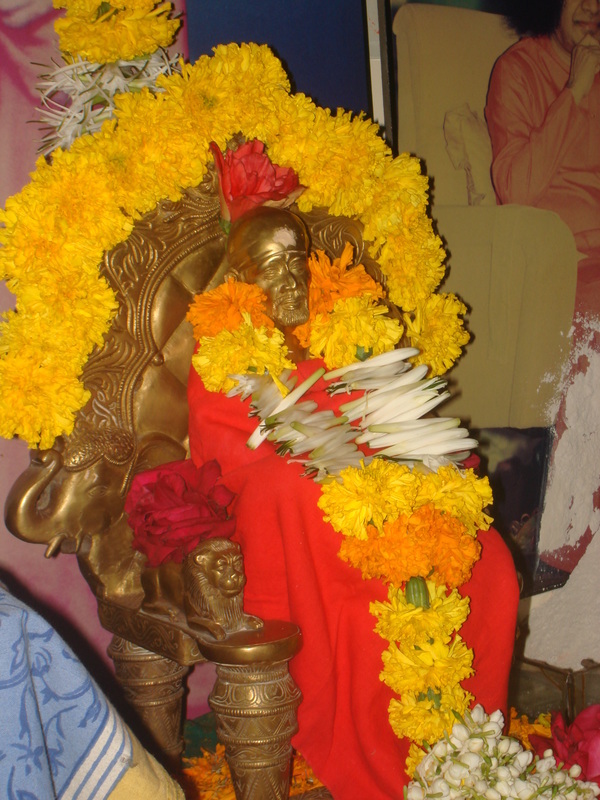 I kept seeing Shirdi Sai Baba, and peacocks, then I saw our Lord Sai's feet moving towards us. These visions faded and I threw my voice wholeheartedly into the resounding bhajans. After bhajans and during the brief meditation, I kept hearing music playing and further singing. I listened intently and it sounded like a chorus of people singing simply Sairam. I could even hear the harmonium so distinctly I thought someone in the room was still playing it, I peeped out of one eye and saw that there was no one playing harmonium. The beautiful singing continued and vivid visions of our Lord Sai stepping into a small pool of water surfaced. Swami sat down and circled his Divine Hands. As I gazed at His enchanting, beaming face I didn't notice the aarathi flame being offered to me with vibuthi. Srimayi gave me a little tap, whirling me back into ordinary consciousness. I took aarathi and starry vibhuti, the bliss of our Lord Sai's darshan lingering far into the evening and my dreams.